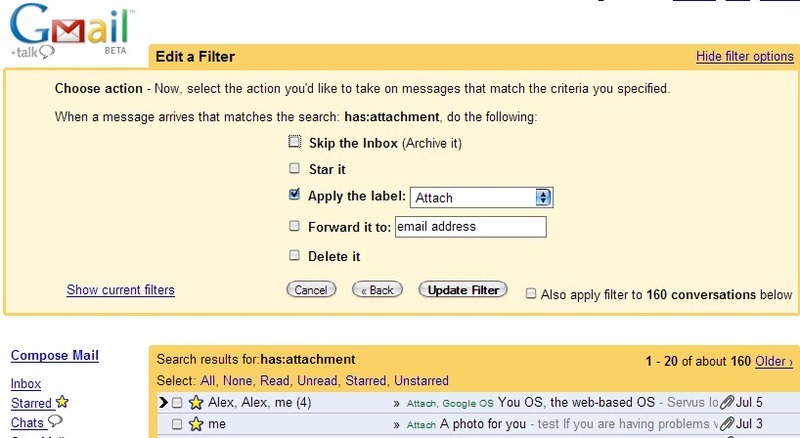 Until now, Gmail allowed users to set filters only for the future emails. Now when you create a filter or update one, Gmail allows you to apply it to old emails (see Also apply filter to 160 conversations below in the screenshot). That's a very useful feature. How could you use it? 1. You change your mail account and you want to send all your emails from the Gmail account to your new one. 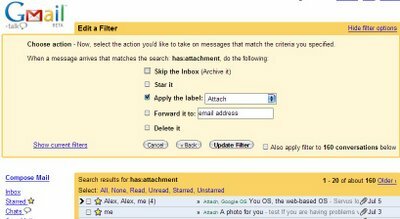 Set a filter without any restriction and forward all the emails. That might also be useful to backup your emails. 2. Forward more emails at once to a friend. Create a temporary label, set the label to the emails you want to forward, create a temporary filter that forwards the emails to your friend. And that's it. Don't forget to delete the filter after that. 3. You want to archive all your emails. 4. Delete all the emails from your ex-girlfriend. 5. Set the label "jobs" to all the emails that contain job in the subject. 6. Merge two labels (A, B). Set the label B to all the emails that have label A. Just type "label:A" in the "Has the words" input box and choose "apply the label B". 7. Filter your sent emails. Include "label:sent" in the "Has the words" input box. You can think of many other nifty applications for this new feature. Like the Delete All Spam link, this feature is not yet available to all the Gmail users. The option to forward messages only applies to new messages. You can't forward old messages right now. I just read it when I tried this function. You are very nice, but there are many people that have these features. It's good to see Gmail alive. Some Yahoo executive said once that Gmail will never get out of beta, as Google can't handle too many users without degrading performances. I can't see anywhere these new features. How come? I would love to have them. It's now Nov. and still no sign of being able to forward large batches of old mail. This write-up is torture because YES there are many reasons this would be helpful. hi, i have gave a condition like mails from account 'A@gmail.com' should move to "label:A", In this case the chat message also moving to the label, but i don don't that. The gmail filter will not forward old mail. Sad to see this message in Gmail (in very tiny letters) AFTER I already set the filter to forward all the mail from a good friend and delete it after that. Gmail DID erase all these e-mails, but never forwarded them. The option of Filter is locatated on the top when you login gmail called 'Settings' and once you click on that, you will find out there is a tab call Filter. Mine only lets me forward new emails. I also have the small letters that say so when I set the filter up. So, when I try to save my emails to my OUTLOOK, I get an automatic shutdown. This has happened twice. What a pain. Why oh why oh why oh why is gmail being stupid about this???????? I want just to forward 100 conversations to another email account. How to forward my all messages? I want to send many mails under 1 label at one go using Gmail. How this can be done? Great .. Nice tip ..
Googles ultimate purpose is to control all the information in the world. Thats why moving mail from other places into gmail is supported but moving mail away from google is not made easy. Simple as that. Unfortunately this is not working anymore. Filters are only applid to inbox. I too have observed that it does not forward old email. Does anyone have a trick for forward existing email to an email id using filters? When you create the search criteria for the filter, you can do a "Test Search", which will find all email that satisfies the criteria. Then, select 'Also apply filter to the x conversations below' when you Create Filter. The filter will retroactively do the action to them. @Anonymous @December 9 - please read carefully: EXCEPT FORWARDING OLD MAILS! So how can we forward old mail? I have been using one e-mail account for work and personal e-mails, and I'd like to separate the two by forwarding all my old work e-mails to my new separate work account. How can I do this? Also add the new mail account. Copy the messages you want to the new mail account within Thunderbird.